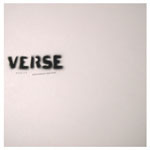 Each test press is hand-numbered and has the A-side label stamped "Verse // Rebuild Test Press # / 14". Test presses have the real LP jackets on them because we had a few extra LP jackets laying around. 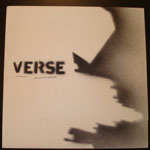 190 copies on black vinyl with blank labels were rushed at the pressing plant so that Verse could have some LPs to sell at Positive Numbers Festival 2004. 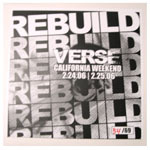 Each of these copies is hand-numbered and has the A-side label stamped "Verse // Rebuild Posi #'s Fest 2004 # / 190". The LPs were finished just days before the fest at a pressing plant in Los Angeles, where we had to pick them up, package them into sturdy boxes, and check them as baggage with us on our flight out to Pennsylvania for the festival. Amazingly, the LPs survived the flight without any battle wounds from the baggage people at the airports. All 190 LPs sold out within 15 minutes of putting them on the table at Posi #'s. 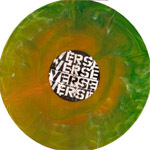 Green marble copies were made specifically for people who pre-ordered directly from the Rival Records webstore. 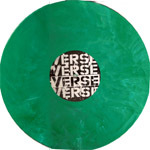 We ordered these with the hopes that they would look exactly like the green vinyl copies of the Judge "Bringin It Down" LP... And they came out just as we wanted (for once)! Well, most of them did... There are some that are pretty light green that look more like a "mint green", but for the most part, they came out with a nice "Judge Green". This is one of a kind, and it's our pride and joy. This copy is the result of the transition between the green vinyl and the gold vinyl in the machine at the pressing plant. When I went in to Bill Smith Custom Records to pick up the completed LPs, I saw this LP hanging on the wall amongst a bunch of other cool "abnormalities" that they've had over the years of pressing records. I told the guy I needed to have that record. He relucantly handed it over, and it is now framed and hangs on the wall near all of the Rival inventory at RivalHQ. 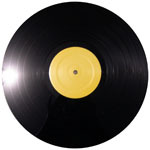 823 were pressed on GOLD vinyl. 41 GOLD copies used for the "schizo" press (see below), 782 have the normal LP jacket. 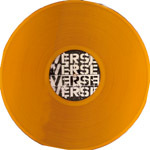 NOTE: there are known copies of Gold vinyl with BLACK streaks/swirl in them. Kyle at Rival has a copy like this, Tru at Malfunction had a copy like this, and I'm sure there are quite a few of them out there, but who really knows how many. What is the "Schizo" press? 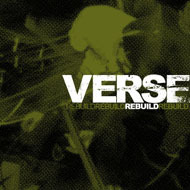 Well, it's a Verse LP that has a split personality: Rebuild.... and... From Anger And Rage. When Rebuild was originally pressed in 2004, 782 GOLD vinyl copies got the normal LP jackets, but then we ran out of jackets. The remaining 41 GOLD copies sat on a shelf in my office for 4 years. At some point I realized I also had about 50 From Anger And Rage gatefold LP jackets left over with no vinyl. So we put the GOLD Rebuild LP + the original Rebuild poster/insert together with the From Anger And Rage gatefold LP jacket. Just for fun, we also threw in 2 loose Rebuild LP labels that we had left over. We stamped the inside of the gatefold LP jacket and the labels of the gold LP with "From Anger And Rage....Comes Rebuilding". All are hand numbered out of 41 and were sold at Rivalry Showcase on February 29th, 2008. This is the elusive "Providence stencil". Originally we thought only 30 or so ended up with the "Providence" part of the stencil (we're seriously not sure how many, Sean was out of it. haha), but now it's looking like there were far less with the "Providence" stencil. Maybe only 5-10? They just don't pop up very often, so it's hard to say. Good luck finding one! Later, the remaining 69 records were used for the California Weekend cover. 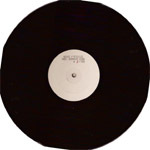 Each are hand-numbered and have the limited cover spray-mounted on a blank white LP jacket. They were only available on 02.24.06 at 924 Gilman St. and the Rivalry Showcase #3 on 02.25.06.